The emotional stress that comes with the job combined with the struggle to keep pace with documentation requirements was taking a toll on Lenoir County Department of Social Services’ (DSS) Child Welfare social workers. At fault was a manual, paper-based process, which contributed to a 73% turnover rate. Since implementing Northwoods’ office- and field-based document management solutions designed for Child Welfare, social workers have access to client and case information wherever they need it to provide clients more holistic, quality service. 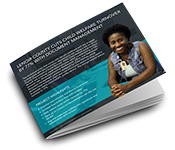 The change helped reduce turnover to 17%.